Happy Halloween from Alternative Armies. Until 5th November you get our brand new Ghostly Bride (worth 4GBP) placed in your order for free automatically. Great for any 28mm game system she is a real character. Read about this linked from this blog post. It is my pleasure to present a new one page free download for players of Flintloque and Slaughterloo giving game statistics and rules for the Ghostly Bride. There is also a link to last years free download featuring Madame Boniface. 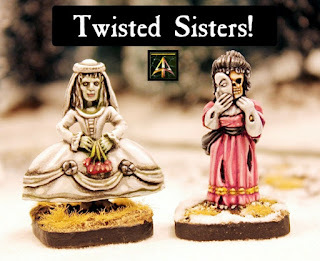 The Twisted Sisters! Thanks for your time.